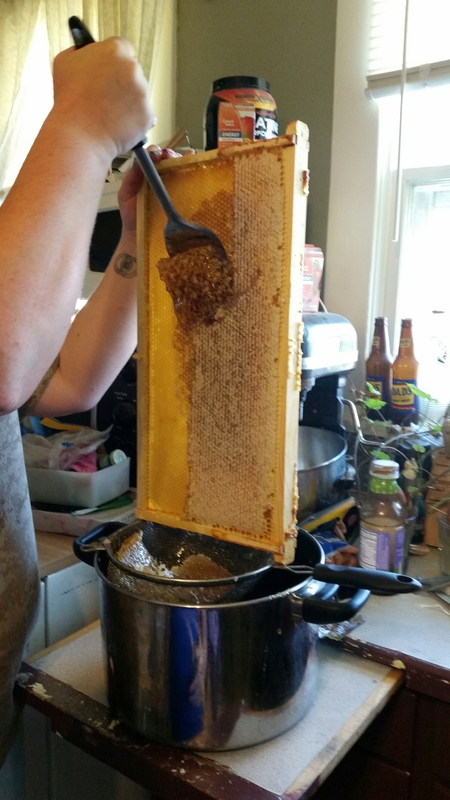 I really, truly believe honey could be currency. It’s such an amazing thing, and fascinating. It takes time, just the right resources, and my wonderful little friends – the bees. We harvested 2 frames from our large super this weekend, it was quite the process, simple but time consuming. The bees weren’t very happy, but I quickly replaced the frames and put the cover back on. Mostly it was just a lot of scraping, removing the comb from the foundation, mashing, and draining. 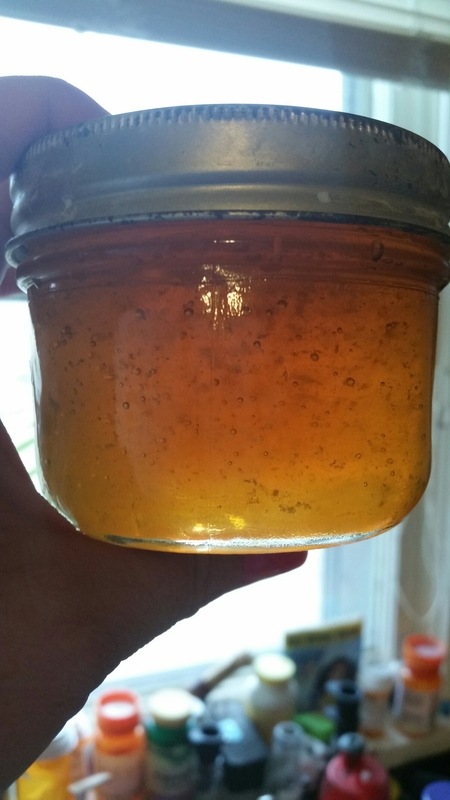 I let the honey drip out overnight to be sure we got as much as possible. 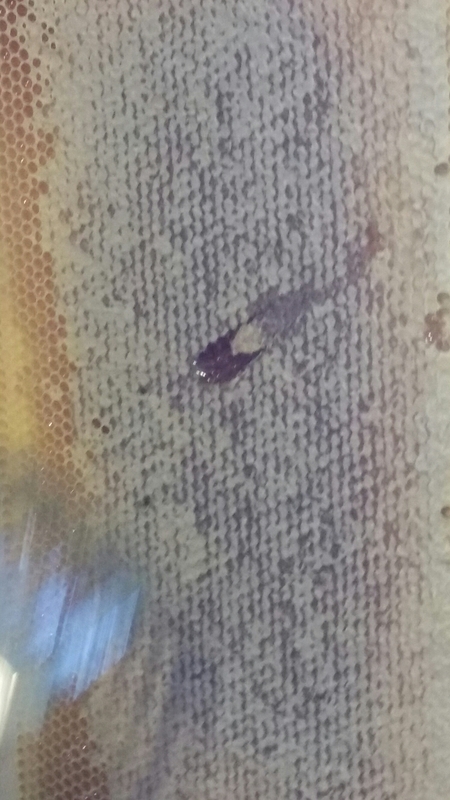 Then I mashed the comb, melted, stained, re-melted, and rendered it all down. I now have a block of usable bees wax, and I plan to use it to make an udder balm for Molly. 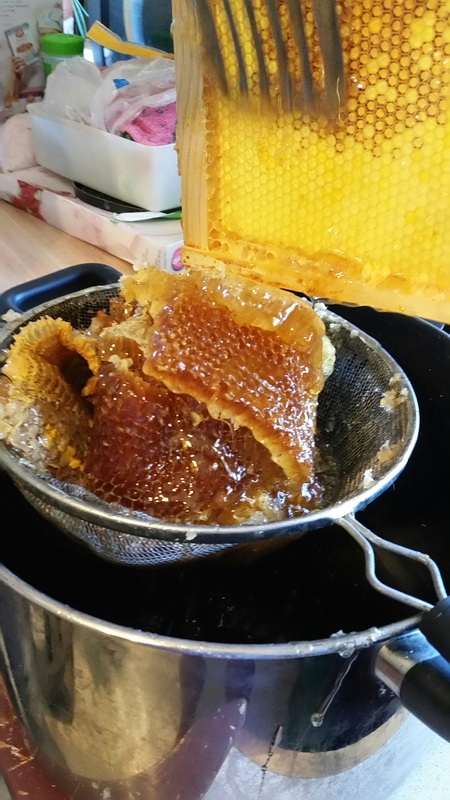 The finished product is a sticky, golden, lovely, delicious honey. And because we choose to smoke the bees only when they are agitated, it tastes amazing. It tastes like alfalfa, if you have ever smelled wet alfalfa just mix that with the taste of honey. It’s amazing, and there are little bits of pollen in it, so it will help with allergies. 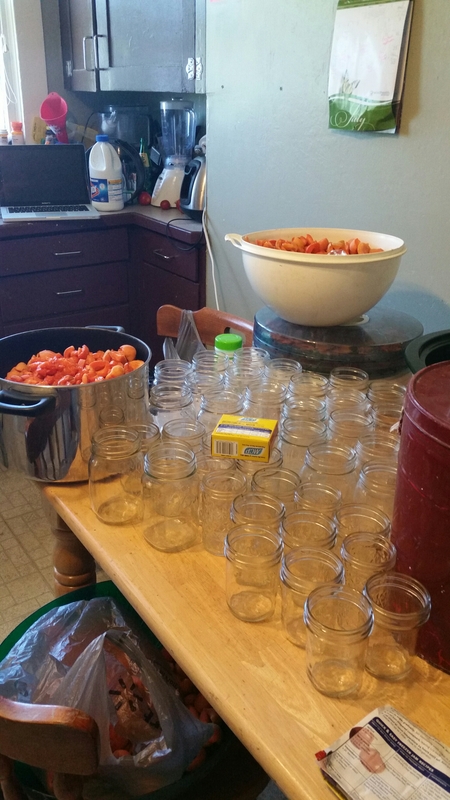 We also harvested 20 gallons of apricots (4-5 gallon buckets) and made a boatload of jam. It’s amazing, and I like it a little more on the tart side so we use a little bit of citric acid to maintain that and help with the color. If you have made apricot jam before, or canned anything really, you know that over time the color trends to fade. Nobody wants to eat brown mush, it’s not very appetizing. Citric acid helps with that, and even though my mother in law swears by it, I don’t like adding food coloring. So these are all natural, no pesticides, and picked from a tree planted by pioneer settlers. It really doesn’t get better than that. Hopefully it will be enough to get us through to another year. The apples are coming along, and much larger than I expected. I don’t remember if I mentioned it earlier, but the trees we have fruit every other year. Last year we harvested apples, so going by the growth of the last 35+ years that my in law’s have lived in the house, we shouldn’t have any apples. But we do, aged they are big and healthy. Still pretty starchy, I found out when I ate one today, but they have fantastic flavor. The frost should hit in a little over a month, and it will convert the starch into sugars (as I understand it). Just in time to dry them for the hunts. They are small, portable, and perfect for the packs. If you have ever eaten dehydrated apples and drank water, you know they are pretty filling. On top of the 2 pigs we are butchering, we also have 2 deer and 2 cow elk tags this fall. If we can fill them all we will have enough meat to feed our family for about 2 years. Cross your fingers for us, we could use it. Even with the lack of water, we still have had a decent amount of produce. Our beans are doing well, and the corn actually has ears! We’ll see if they are big enough to eat, but I’m excited to see them growing. Oh, and the walnut tree I thought was dead has new growth! Lots of exciting things going on around the farm, I will continue to keep everyone posted!